The Carson City Mint is perhaps best known for the large number of Morgan Silver Dollars struck there between 1878 and 1893. Often romanticized as coins of the Wild West, they have been extremely popular and sell for premiums over common-date silver dollars. There are, however, a number of issues produced at this Mint which are perhaps even more fascinating and have more in common with the Wild West than any Carson City Morgan Dollar might have. One of these is the 1870-CC Double Eagle. The year 1870 saw the opening of the second branch Mint of the United States on the west coast. The first had been opened in 1854 in San Francisco as a direct result of the California gold rush. The second, in Carson City, Nevada, was a direct result of the discovery of the Comstock Lode in the late 1850s. Huge silver deposits were discovered which would transform Nevada into a silver state (when the first silver was discovered it was still a part of the Utah Territory). It took almost a decade of lobbying, but the residents of its capital, Carson City, saw the first coins produced with the now famous CC mintmark in 1870. Silver, obviously, was the main focus of the Carson City mint although initial mintages were low. Gold coins, however, were also struck, and this would continue to be the case until the Mint closed for production in 1893. The largest denomination struck was the double eagle, which had been introduced after the California gold rush yielded immense amounts of gold, which needed to be struck into gold coins. The eagle, or ten dollar gold piece, was deemed too small for this purpose, and thus the double eagle was brought to life. It would be one of the prime pieces (together with the silver dollar) which the Carson City Mint would produce during its first year of production. There is no doubt that the 1870-CC Double Eagle is rare, and its low mintage certainly plays an important role in this. Only 3,789 were produced at the Carson City Mint in 1870, and it is likely that a number of those were melted before they ever left the Mint. Others circulated heavily throughout the Western United States and ended up being melted at a later date. These factors all contributed to the rarity of the 1870-CC Double Eagle. The low mintage of the 1870-CC Double Eagle has various reasons. First of all the number of coins struck was directly linked to the amount of gold (or silver in case of lower value coins) that was deposited at the Mint by private depositors. Most of the gold and silver that was found on the West Coast was shipped directly to the San Francisco Mint, where it could be minted in any denomination that was requested. Because of the relatively smaller premium on higher value coins, most depositors would choose to have their silver minted in Dollar coins and their gold in Double Eagles. Research has proven that the amount of gold deposited at the Carson City Mint was relatively small (as was the amount of silver deposited throughout the year, and this would remain the case for a number of years to come). Furthermore the inexperience of the workers at the Carson City Mint also needed to be taken into account. This was a newly opened Mint in a remote area of the United States. Equipment and experience mostly had to be brought in, and while San Francisco was relatively close, it still was a long trek. Because of these factors, production was slow and a lower number of coins were produced compared to later years (which, in case of the Carson City Mint, would come in 1874/1875, when mintages were much higher). Most of the 1870-CC Double Eagles that are now known to exist are poorly struck, sometimes on planchets with defects, and often lacking eye-appeal. Furthermore uncirculated examples of the 1870-CC Double Eagle are virtually unknown and extremely rare for other issues struck at the Carson City Mint in 1870. This does not contribute to the eye-appeal of most surviving specimens but it does add to the desirability of prime examples which are of better quality than most others. As previously mentioned there are no uncirculated specimens confirmed of the 1870-CC Double Eagle, and the finest known roster is represented by an extremely limited number of AU coins. The absolute finest known is an AU-55 which has been certified by NGC. The coin truly is the finest known and last sold for $414,000 in the sale of the Southerly collection in 2009. The finest known at PCGS is graded AU-53 and was last sold in 2004 for $368,000. Two specimens are known to have graded at the same level at NGC, although it is possible that one of these is the coin which later graded AU-55 at the same grading company. Resubmissions of the same coin to any particular grading company (often more than once) is something which certainly has to be taken into account when studying the population reports of this famous issue. In lower grades most survivors grade VF to XF, indicating that they circulated for a number of years. These remain extremely valuable, especially in problem-free condition, which are all valued at a minimum of 6 figures. Because of the rarity of this issue in all grades (there are an estimated 30-35 known to exist) it is difficult to determine the true value of any 1870-CC Double Eagle, problem-free or not, and auction records usually give the best indication. Soft strikes and other problems are virtually always present on this issue. 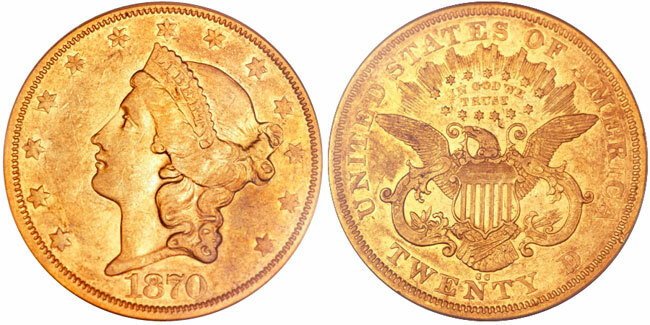 When purchasing an 1870-CC Double Eagle this certainly has to be taken into account although it has to be said that such problems have only a minor effect on this issue, thanks to its great rarity and status as one of the most famous of all twenty dollar gold pieces struck by the United States Mint, and in particular of the Carson City Mint.